With the pentangle portrayed in purest gold. (Sir Gawain and the G. K. 2.619-623). An anonymous contemporary of Geoffrey Chaucer wrote Sir Gawain and the Green Knight in the 14th century, outlining an adventure of Sir Gawain, a knight of King Arthur’s Round Table. Gawain represented the perfect knight, as a fighter, a lover, and a religious devotee. 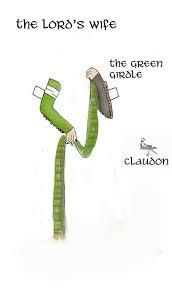 It was written in a Northern dialect and uses alliteration similar to the Anglo-Saxon form of poetry. Alliteration is characterized by the repetition of consonants and a sharp rhyme at the end of each section. The story begins as King Arthur’s court celebrates the New Year for fifteen days. The lords and ladies of the court are having a great time dancing and feasting. The story describes the lavishly served feast with all the trimmings. Each guest is free to partake in the royal meal. However, King Arthur will not eat on such a high holiday until someone tells a fascinating or adventurous tale. 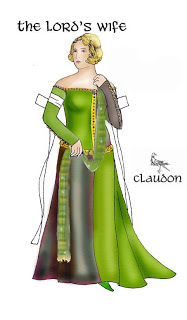 The poem describes Gawain’s armor in detail. He carries a red shield that has a pentangle painted on its front. 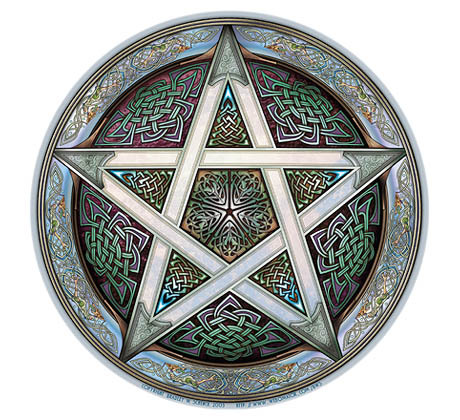 The pentangle is a token of truth. Each of the five points are linked and locked with the next, forming what is called the endless knot. 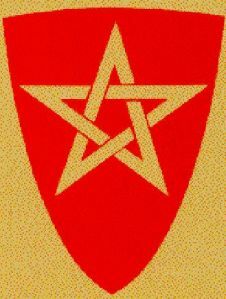 The pentangle is a symbol that Gawain is faultless in his five senses, never found to fail in his five fingers, faithful to the five wounds that Christ received on the cross, strengthened by the five joys that the Virgin Mary had in Jesus (The Annunciation, Nativity, Resurrection, Ascension, and Assumption), and possesses brotherly love, pure mind and manners, and compassion most precious. The inside of the shield is adorned with an image of the Virgin Mary to make sure that Gawain never loses heart. Long before the narrator of Sir Gawain and the Green Knight placed the pentangle on the shield of “that peerless prince,” it was an object of importance, and has enjoyed a place in the philosophical and theological forums of many cultures. The earliest found depiction of the pentangle, located on a piece of pottery found in the ruins of the ancient city of Ur, dates back to around 900 BCE, placing it well within the early Babylonian period (Stone, 135). The Pythagoreans where fascinated by its mathematical and geometrical implications and spent much of the 3rd 4th and 5th centuries BCE trying to unlock its mysteries. 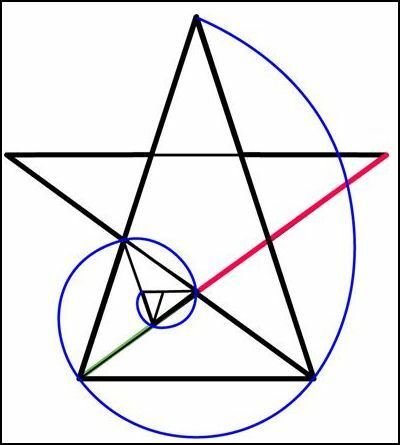 In fact, most all Greek geometry, mathematics, and architecture are based on the perfect harmony found in the pentangle. The neo-Platonists and the Gnostics could not resist the call of the pentangle, and tied many of their studies and mysteries to this eminent symbol. 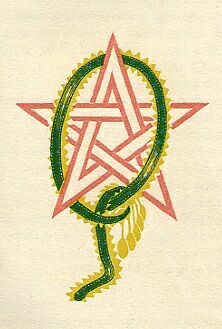 However, the pentangle gained its most prominent state in the Middle Ages when Christianly and Islam adopted this symbol as a major part of their religions, both using it as a symbol of harmony, virtue, and idealism (Hulbert, 722). The regular pentangle is formed from a regular pentagon, either by drawing its diagonals or by extending each edge until it meets other edges that are not its immediate neighbors. The edges of the regular pentangle divide each other so that the ratio of the larger part to the smaller part is equal to the ratio of the whole line to the larger part (Cundy & Rollett, 68-77). This ratio, (1 + square root of 5/2), was named by the Pythagoreans as the ‘Golden Ratio’ and is commonly represented by the Greek symbol Phi. 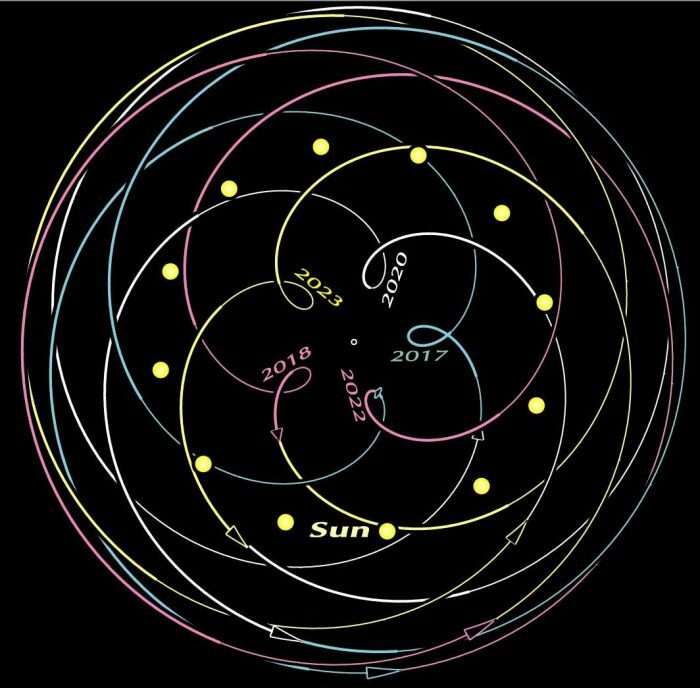 -Successive inferior conjunctions of Venus against the Zodiac form a Pentagram. In Sir Gawain and the Green Knight the narrator employs the pentangle to illustrate the central conflict within the story, which is Gawain’s inner fight, rather than his ordeal with the Green Knight. Each of the five points of the pentangle represents a set of Gawain’s virtues: his five senses, for he is “faultless in his five senses;” his five fingers “Nor found ever to fail in his five fingers;” his fidelity, “his fealty … fixed upon the five wounds that Christ got on the cross;” his force, “founded on the five joys / That the high Queen of heaven had in her child;” and the five knightly virtues: friendship, generosity, courtesy, chastity, and piety (lns. 640-54). During his stay at the host’s castle, each of his five five-fold virtues represented in the five points of the pentangle fail him. Gawain’s physical abilities (his five senses and his five fingers) begin to fail him in line 900 when the “wine goes to his head” and continue to fail as he spends the majority of his time in bed or lounging around the castle. Although Gawain frequently calls on Jesus and Mary for aid in the wilderness, once inside the court, his piety fades to the background, and his fidelity to the five wounds of Christ and five joys of Mary slips into obscurity. Then with his physical and spiritual virtues wavering, Gawain’s five knightly virtues also fall under careful inspection and begin to falter. The fifth five is Gawain himself, who embodies the five moral virtues of the code of chivalry: “friendship, generosity, chastity, courtesy, and piety”. All of these virtues reside, as the poet says, in the “Endless Knot” of the pentangle, which forever interlinks and is never broken. This intimate relationship between symbol and faith allows for rigorous allegorical interpretation, especially in the physical role that the shield plays in Gawain’s quest. Thus, the poet makes Gawain the epitome of perfection in knighthood through number symbolism. This portrayal Gawain’s quest in terms of the pentangle successfully compares the perfectly balanced knightly ideals represented in the pentangle itself, to the reality of Gawain’s life and actions that we see while he is in the castle. Even Gawain, “the greatest knight of all” falls short of the pentanglean ideal, reminding the reader that no one can reach perfection. However, instead of becoming bitter at our shortcomings and failures, we should learn from our mistakes. A message, not only particularly important to a culture in which the leaders did all they could in order to gain personally, often using the chivalric codes only when by doing so would serve their own purposes, but also to anyone in any age who meets with the disappointment of not “measuring up” to the pentangles in their lives. The pentacle on Gawain’s shield is seen by many critics as signifying Gawain’s perfection and power over evil. The poem contains the only representation of such a symbol on Gawain’s shield in the Gawain literature. 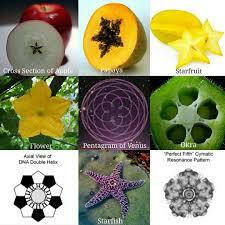 What is more, the poet uses a total of 46 lines to describe the meaning of the pentangle. No other symbol in the poem receives as much attention or is described in such detail. The poem describes the pentangle as a symbol of faithfulness and an “endless knot”. In line 625, it is described as “a sign by Solomon”. Solomon, the third king of Israel, in 10th century B.C. was said to have the mark of the pentagram on his ring, which he received from the archangel Michael. The pentagram seal on this ring was said to give Solomon power over demons. Along these lines, some academics link the Gawain pentangle to magical traditions. In Germany, the symbol was called a Drudenfuß and was placed on household objects to keep out evil. The symbol was also associated with magical charms which, if recited or written on a weapon, would call forth magical forces. However, concrete evidence tying the magical pentagram to Gawain’s pentangle is scarce. Gawain’s pentangle also symbolises the “phenomenon of physically endless objects signifying a temporally endless quality.” Many poets use the symbol of the circle to show infinity or endlessness, but Gawain’s poet insisted on using something more complex. In medieval number theory, the number five is considered a “circular number”, since it “reproduces itself in its last digit when raised to its powers”. 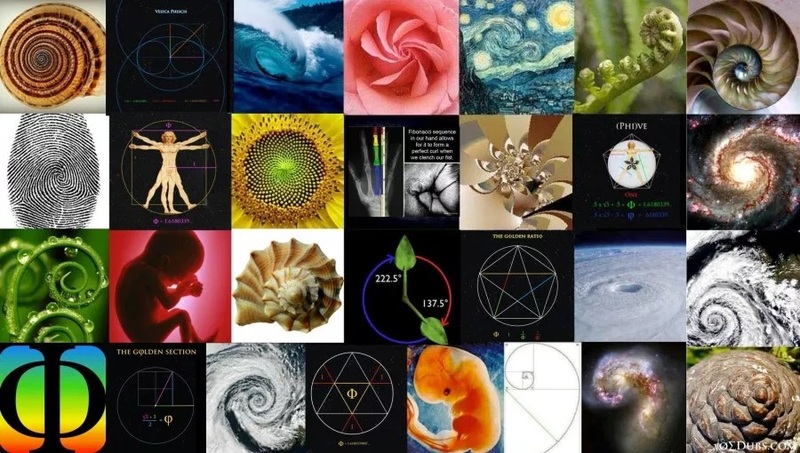 Furthermore, it replicates itself geometrically; that is, every pentangle has a smaller pentagon that allows a pentangle to be embedded in it and this “process may be repeated forever with decreasing pentangles”. Thus, by reproducing the number five, which in medieval number symbolism signified incorruptibility, Gawain’s pentangle represents his eternal incorruptibility. 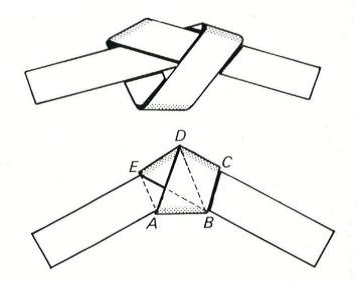 You do not need a cord when constructing a regular pentagon. You take a strip of paper and place a simple single button there. Press the button gently flat and this has turned into a regular pentagon. Do you have a small one then you can magnify it by drawing lines parallel to the circumference….